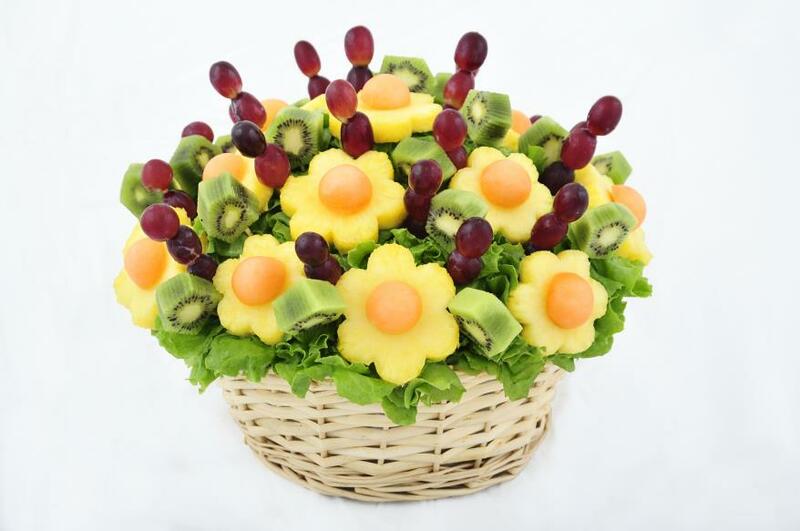 Purchase of a Tooty Fruity training programme gives you the rights to use our branding and designs for the purpose of making fruit arrangements and bouquets only. Copyright of the designs remain with Tooty Fruity™ International and you may not copy, alter or make use of the Tooty Fruity trademark in any way other than as a fruit bouquet/arrangements supplier in accordance with the methods and techniques described in the relevant programmes. If you use any other trading name and produce other designs and arrangements or products other than those provided by Tooty Fruity, then those products must not include any reference to Tooty Fruity, including the website address and the logo - unless written consent is received from Tooty Fruity™ International. If you use ribbons, stickers or branded cellophane provided by Tooty Fruity as presentation material for fruit bouquets/arrangements designed or provided by any supplier other than Tooty Fruity, this is at your own risk and responsibility. In particular, Tooty Fruity Arrangements Ltd will not accept any liability of whatsoever nature arising from this, whether to other suppliers, consumers or otherwise. Any product produced under the name of Tooty Fruity will need to be clearly marked with a ‘best before’ date and normally this will be within 2 days of the purchase. It is also essential that storage and consumption details are provided as a ‘care card’ with each Tooty Fruity product produced and sold. It is the purchaser of a Tooty Fruity training programmes’ responsibility to manage their stock in accordance with recommendations / health and hygiene guidelines. Tooty Fruity Arrangements International will not accept any liability of whatsoever nature arising from this, whether to other suppliers, consumers or otherwise. Tooty Fruity™ International does not warrant that the operation of the Tooty Fruity website, hosting of the domain name or the head office 0845 number will be uninterrupted or error free because of the nature of those services, and no liability or losses consequent on such matters will be accepted by TLtd. All material provided is owned by Tooty Fruity™ International and is subject to copyright protection. You must not copy/reproduce any of the material, in any circumstance, without the prior written consent of Tooty Fruity International. Tooty Fruity International does not give any guarantee or warranty in connection with sales volumes, profitability or any other aspect of the business and the contents of this website should not be interpreted as a promise or guarantee of earnings. Earning potential is entirely dependent on the person using our product, idea and techniques. This business is not a ‘get rich quick’ scheme and requires effort and work to get your business established. Your level of success will depend on a number of factors outside our control, including the time that you devote to the business, the way in which you deploy the ideas and techniques provided your existing knowledge and skills. Since these factors differ according to individuals, we cannot guarantee your success or income level, nor are we responsible for any of your actions. Where applicable, we will agree to not sell a Tooty Fruity training package to anyone else who lives in your agreed territory area. This contract remains in place, on a rolling subscription basis, on receipt of your monthly 'territory license fee' to Tooty Fruity. The lock-out does not stop another Tooty Fruity purchaser transacting business or marketing themselves within your territory. It does mean that we will not actively sell a Tooty Fruity package to anyone else who lives in your territory area. We would recommend working with other Tooty Fruity purchasers of the programme (on an affiliate basis) to enable greater delivery coverage of your products. All purchasers of the Tooty Fruity training packages will be required, as part of their purchase, to pay a monthly subscription fee. This will enable them to trade under the Tooty Fruity trademark/brand; utilise all Tooty Fruity product designs, photographs, visuals and marketing material. If any Tooty Fruity purchasers unsubscribe to this monthly fee, then they relinquish the right to trade under the Tooty Fruity trademark, use any Tooty Fruity branded packaging or designs. The Tooty Fruity™ licensees are not our franchisees, agents or employees. They do not have any right to speak for us or on our behalf, or bind us to any contracts or obligations. We are not responsible for any of the acts or omissions of the Tooty Fruity™ licensees, including, without limitation, in connection with their provision of products or services to you or fulfillment of orders placed by you through this Website, or via their trading businesses/outlets.